Back on 23 December 2012 in my role as Matte Gray, Protector of the Public Aesthetic and Chastiser of the Tasteless, i posted a photograph of a new set of lean, modern condos on Noe Street that had been adorned with ludicrous neo-Early American light fixtures. 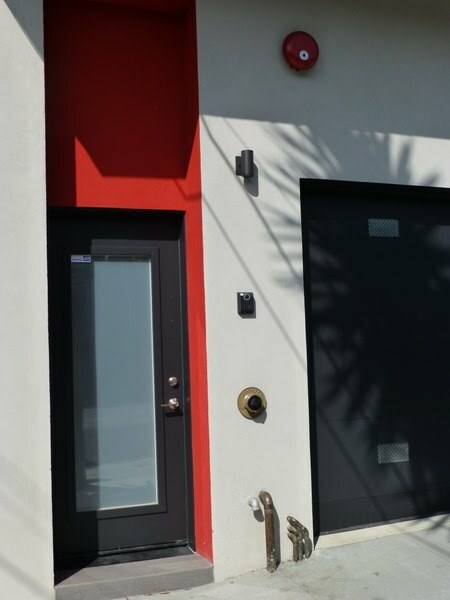 Finally, last week i noticed that the owners had wilted under the lash of public scorn and replaced the offending fixtures with simple black cylinders. Vigilance maintained. Offenders exposed. Corrections noted.